It is widely accepted that exercise is one of the best ways that you can improve your health, either mental or physical. The benefits of exercise are widespread, and few workouts can match the effectiveness of cardio, but the importance of muscular training is not to be underestimated. If you are looking to improve your fitness regimen, there are few better things you can do aside from purchasing equipment so that you can exercise from the comfort of your own home. One of the biggest obstacles between you and getting the right amount of exercise you need is time, and these products can help immensely. Over the course of today’s article, we are going to be presenting five of the best rowing machines in UK. We’ll take an in-depth look at each of these workout machines and then give a general overview so that you can get an idea of what to expect from the product you have your eyes on. Finding the best rowing machines doesn’t have to be a challenge, and we hope that we can make it simpler for you. After our reviews, we’ll also be taking a look at some of the most critical features to search for in a rowing machine so that you know exactly what you will be getting out of your model. Without any further delay, let’s get right into our reviews! 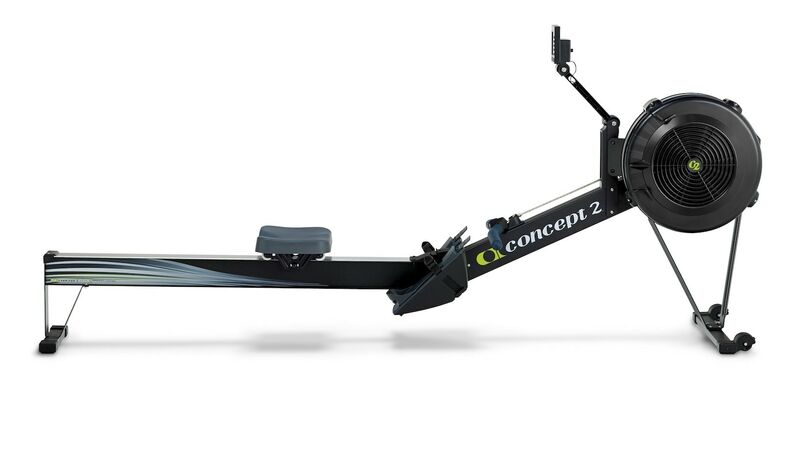 If you’re looking for the best rowing machines, it is likely that you will come across the Model D from Concept 2. While this machine may seem as simple as its name, you will find that it is, in fact, one of the most reliable rowing machines in the world, and it comes with a few more bells and whistles than you may think. Perhaps the most notable inclusion that you’ll find on this rowing machine is the Performance Monitor 5, which will help you immensely when it comes to keeping track of your workouts. You’ll get the data from each stroke so that you know how to improve your form and technique. This rowing machine is also much more user-friendly than many other models, though it is not through an impressive UI (user interface), like with many overpriced rowing machines. Instead, the designers of this machine tried to improve the user experience by making the rower both quieter and smoother. The flywheel operation that is used by this rowing machine is the reason why it is so much better when it comes to smoothness and noise levels, but it is optimized to improve them even further. Even the seat of this rowing machine can be adjusted for a more comfortable sitting position. While deciding between the available best rowing machines, you may be looking for something that is a little more affordable than many of the other options, or perhaps more portable. The JLL R200 ticks off both of these boxes and many more, but its folding design is its most notable feature. 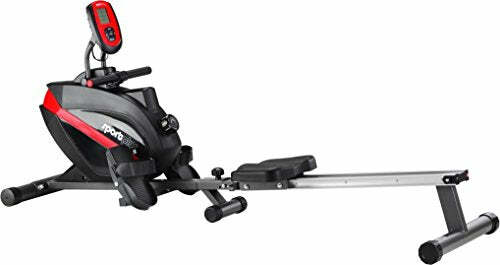 The R200 was designed from the start as a rowing machine that is more portable than many of the other models out there. Since you can easily fold this machine up and pack it into your car, it is an excellent option if you find yourself constantly traveling but you don’t want to give up on your exercise. Of course, the pitfall with many foldable rowing machines is that they often compromise the quality of your workout so that they can be more portable. That is thankfully not the case with the R200 as its belt-drive system ensures that you will always have a smooth rowing motion. Comfort is not a given when you are purchasing rowing machines at this price point, but we are glad to report that this model is designed with ergonomics in mind. The seat features foam padding so you won’t have to deal with any soreness after a long workout session, though the footrests may be a little small. Overall, we were impressed with the quality of this model. If you need a quality rowing machine, this model from JTX Fitness is a great choice since it comes equipped with so many different bells and whistles. Unlike other high-quality rowing machines, however, it doesn’t rely entirely on its extra bits to prove that it’s worth the money, as the Freedom air rower features excellent performance. A unique system that consists of a mix of electromagnetic as well as air resistance is at the heart of this rowing machine, and this hybrid mode of operation is responsible for its smoothness. If your arms get sore from the jerkiness of other rowers, you’ll have nothing to worry about when using the Freedom. You have a choice of 16 different levels of resistance, or you can opt for one of the 8 training programs that come installed on this machine. If you use the included chest strap, the machine will be able to track your heart rate, and you will be able to perform your workouts with resistance shifting in time with your heartbeat. This machine is built out of aluminum, so you can rest assured that the frame will be reliable enough to last without weighing too much to be transported reasonably. The Freedom air rower is even equipped with wheels on the underside so that it is easier to move around and situate correctly. This indoor rower from Sport Plus is proof of the fact that you don’t need to spend a lot of money to get a rowing machine that is capable of doing everything you need. While this product may not be as impressive as models that can be found for twice as much, it will still get the job done admirably. As with most models that are this affordable, the Sport Plus indoor rowing machine makes use of an electromagnetic flywheel system with a cable. While this may not be the smoothest system that is used to operate this machines, you will find that it is silent enough to keep you from getting distracted. You have a choice of eight different levels of resistance with this machine, as you do with most, so you won’t be missing out when it comes to the variety of your workouts. Surprisingly enough, this model even comes equipped with a fitness tracker, though it is one of the more basic types. While you won’t pay a hefty premium for this machine, it will still be comfortable enough for daily use, as it comes with a seat that features an ergonomic design. The saddle is mounted on ball bearings for a much smoother roll, making your workout less jittery, though they may have to be lubricated from time to time. When you’re looking through the available options for the best rowing machines, you may be looking for something that is a little more affordable. If that is the case, the Body Sculpture Rower is one of the best options you’ll find in its price range thanks to a variety of features and an intelligent design philosophy. 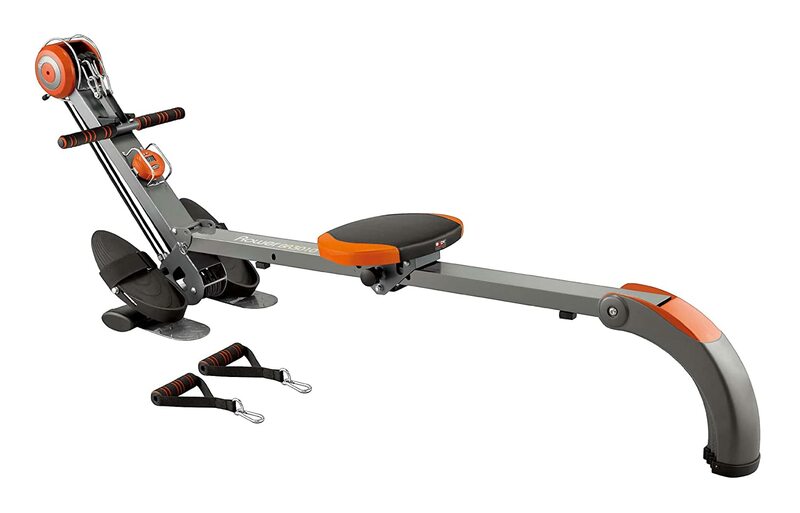 This rowing machine comes equipped with a little more than just the bare necessities, which is more than you can say for most other models on sale for a similar price. For example, you will find a small fitness tracking computer that will let you know how far you’ve gone, how many calories you’ve burnt, and more. You also won’t be disappointed with this product when it comes to how comfortable it is as it features an ergonomic saddle that is meant for intense and frequent use. The carriage that mounts the seat to the rail features six wheels for a smooth ride, though they will need to be oiled from time to time. The hydraulic cylinder that is responsible for the incline on this model is easy to set due to the knob that you will find on it. You can choose between 12 different resistance levels when using this machine. You won’t have to give up quality for affordability when you decide to purchase this model. A rowing machine or an indoor rower is an exercise machine that you use the way you would on an actual rowboat. It has different mechanisms and parts that allow you to paddle forward and back, the seat sliding in the manner your boat would were it in the water. Rowing machines are used by sport rowers to train for competition even without access to a boat or a rower. Indoor rowers are therefore highly prized for their convenience for athletes. Recently, indoor rowing has become a competitive sport in its own right. Rowing machines are also used by non-professional athletes and is a popular form of exercise because it develops most muscle groups, and more importantly, burns a lot of calories even while being a low impact activity. A hydraulic rowing machine is an excellent option for those with limited space, or where budget is a concern. These rowers are tensioned by air or fluid contained within a cylinder or piston that can be adjusted to increase the degree of resistance. The disadvantage of hydraulic rowing machines is that the exercise position does not allow you to assume a natural rowing stance. Therefore, syncronization between arms and legs is somewhat unnatural. The Concept 2 indoor rowing machines is probably the most popular flywheel air rowing machine as used by fitness enthusiasts and health clubs throughout the world. The Concept 2 is also used in rowing competitions all over the world, including the Worlds’ Indoor Rowing Championships and European Indoor Championships. Flywheel or air Indoor Rowing Machines offers the closest simulation to outdoor rowing. With these rowers, resistance comes from the pulling motion. To increase the resistance you simply pull harder and greater wind resistance is provided from the fan blades. Compared to hydraulic rowing machines, flywheel or air rowers provide a smoother rowing stroke. The Magnetic Resistance Indoor Rowing Machine provides a silent and smooth rowing action. Unlike the flywheel indoor rowing machine that provides its resistance by wind, the magnetic resistance rowing machine uses a magnetic braking system. Another beauty of the magnetic rowing machine is its silent operation. This is because magnetic resistance produces no friction, resulting in a virtually noise-free work-out. If it’s a magnetic resistance rower you want, these rowers can be purchased using magnetic resistance only, or a combination of air and magnetic. Water rowing machines are ideally suited to those outdoor rowers among you. The water rowing machine’s water flywheel imitates the movement of a boat through water. Similar to rowing outdoors, the WaterRowers’ flywheel collects resistance by beating the effects of drag by water on the tank. Like the magnetic rower, the water rowing machine runs silently with just the swishing sound of water as you row. The WaterRower is built with a wooden frame. Vibrations are keep to a minimum and the commercial version of this rower has a metal frame. The first thing that you will want to account for when it comes to choosing the right rowing machine is the size of it. While rowing machines of different sizes will have a bit of variation when it comes to performance, the main reason why you should account for it is to make sure that it will fit in your home gym. Nobody wants to end up stuck with a rowing machine that won’t even fit into their home, as they will then have to either return it or try and sell it at a loss. Measure the area that you have set out for your rowing machine, and triple-check that it will be small enough to wedge into that spot in the first place. Many rowing machines come equipped with tracking systems to ensure that you are working out to the best of your abilities and using up as much energy as you need to. The level of sophistication of a rowing machine’s tracking systems can have a significant effect on the price, user-friendliness, and much more. For example, some models will come equipped with what is essentially a standalone computer, giving you access to graphs and advanced data about your fitness routine. Other models will come with something as simple as a calorie tracker installed, while others yet will have no fitness tracking provisions. One of the most crucial things to search for in your new rowing machine is an adequate level of reliability. A product that isn’t built to last is one that is quite simply not worth your money. The importance of getting a machine that will work for a long time is further emphasized when it comes to the price of some rowing machines. If you are going to be paying hundreds of dollars for a home workout machine, you don’t want to come to the sudden realization that you’re stuck with a pile of junk when it stops working. Reviews and customer testimonials tend to the best way to determine whether or not a rowing machine is built for quality. As with many other home workout implements, you will also want to ensure that your rowing machine is easy enough to put together. Some machines will need two or even three people to put together, and that can be a bit of a challenge to organize when you’re living on your own. There is also the simple fact that you will want to try out your new rowing machine once you get it, so a shorter assembly process helps cut down on the anticipation when it arrives. Most modern rowing machines feature a modular assembly process where they come in larger pre-assembled sections for greater ease. One final thing to search for in the best rowing machines is a sufficient degree of portability. If you are the type of person that likes to work out in different areas of your home, you will want to be able to bring your rowing machine into another room without having to call for some help. Keep in mind that your rowing machine will still have to be relatively substantial so that it won’t tip over while you are using it. To this end, many rowing machines may be heavy, but the best ones come equipped with wheels on the underside to make it easier to move them around the house. When searching for the best rowing machines, you will want to make sure that they are silent enough to make for a pleasant workout. You won’t want to wake up your flatmates or anyone else in the home when you are working out later during the night, and louder machines simply get annoying. Different systems of operation will feature varying noise levels, and you may have to choose between smoothness and low sound, though the best rowing machines won’t require compromise. A rowing machine is easily the best fitness machine you can buy because it will give you a full body workout: you get to burn calories and build muscle, in fact you can build several muscles in your body in one session. With each stroke, you get to exercise your back, abs, upper body and lower body too. Unlike in an actual rowboat on the water, your legs will have more to do on a rowing machine because the seat slides forward and back with every stroke. Those who exercise with other fitness machines tend to favor one extremity over the other, resulting in overly large arms and back, but small legs, and vice versa. The rowing machine lets you work out both extremities at the same time, keeping your body very much in proportion. Another important benefit of using a rowing machine is that it is kind to your body, unlike other fitness machines out there. Your legs are in full motion when using the rowing machine, but they do not bang heavily on hard, punishing surfaces, making indoor rowing a low impact exercise. This means great protection and care for your knees and ankles. Since you will be in constant motion, you will be losing a lot of weight while toning the right muscles. Aside from burning calories, and unwanted fat, you will give your heart a good workout too. Many also advocate the powerful benefits of exercising with a rowing machine for your mind. The rhythmic movements of the indoor rower have a calming effect on the brain, easing out any stress that worked itself into your body along the way. Although the rowing machine is a superb fitness machine, you will have to know the proper way to use one, and just like in any exercise regimen, you will need to learn the right techniques, including how to position your back to avoid cramping and back pain, and the right breathing methods to get the most out of your workout. Once you get the hang of it, it is actually quite easy. It is just a matter of not bending too far forward or leaning to far backward to get the right angle, and sometimes you just have to remember to breathe. Using the proper body mechanics and the right techniques while rowing is imperative to avoid muscle injury or back strain. The correct way to use a rowing machine involves different phases, including the catch, drive, finish, and the recovery. Before starting to use your rowing machine, or any other type of exercise equipment, always be sure to warm up by stretching first to protect your muscles. With the heels firmly in place and resting in the footrests with the straps around the feet, using an overhand grip hold onto the handles and extend the arms straight out toward the flywheel. Sliding forward until the calves are in the vertical position, leaning forward just slightly at the hips. Extend the legs, pushing off the footrests, keeping the arms and back straight. Straighten the knees while gradually bending the arms as the upper body leans slightly backward. With the elbows bent, the handles should be pulled in toward the abdomen, extend the legs, leaning back very slightly at the hips. Straighten the elbows, which extends the arms and returns the rowing machine’s handles toward the flywheel. As the torso leans forward starting at the hips to follow the fluid movement of the arms, the knees should begin to bend gradually as you slide forward on the seat, returning to the start position. Much like the start position, the catch phase involves extending the arms straight, with the wrists flat, and sliding forward until the lower legs are vertical. While leaning forward slightly at the hips, you are now in position to begin the next stroke. Exhale as you pull the handles toward you, and inhale as you then return back to the starting position. Remember to always keep your chin away from your chest to ensure you are breathing properly and getting as much air as possible. Avoid muscle strain by focusing on the arms and legs doing the work, and not the back. When first using a rowing machine, 10 minutes is the recommended maximum amount of time for the first week, adding time as your strength and endurance build. As with any type of exercise, always check with your doctor before starting a rowing machine exercise regimen, particularly if you have cardiovascular or back problems. While the rowing machine does in fact provide a good workout for those with lower back problems, using the wrong technique or the wrong form may actually do more harm than good. It is always advisable for a beginner to start with basic rowing machine exercises that is normal push –pull movement as in the normal process of rowing a boat. This exercise will include the movement of all of the four limbs of your body and at the same time it will also include the abdominal and lower back muscles. As you get use to the rhythm of the movements you can change the level of resistance and at the same time you should decrease the rate of the limb movements as each of the stroke would require greater amount of energy and if you continue with the high speed rowing movements then it is most likely that you would feel exhausted very soon. As soon as you are able to maintain the endurance level in your body you may increase the resistance further or increase the speed of the movements but always remember to do it one at a time. The basic set of movements is meant to give a complete workout to the muscles of your body. If you are interested to give a through toning up to your upper body muscles then, it is advisable to keep the legs of your body stationary and move your hand with the upper body while going through the rowing motions. By this way only your upper body will get the workout and the lower body would be in a resting position. To get the better results you may increase the resistance level that would help you to build and shape the biceps and triceps, beside that your abdominal muscles would also get a though workout. If you are interested to give a thorough workout to your lower body parts like the legs, thighs and buttock muscles then the upper body movements have to be restricted and the lower body passes through the different levels of resistance. If you are desirous of burning your excess fat from the body then you are advisable to go through the basic set of rowing movements. It gives the workout to complete set of muscles present in the body and at the same time burns out the extra calories. There are many more movements possible with the rowing machines that you will learn slowly as you get accustomed with your rowing machine. We hope that this review guide has given you all of the information that you need about these five different products. We have tried to include a little something for everybody in this article. Thank you for taking the time to read over our list of the best rowing machines!